SUMMARY: In this week’s chart, we learn about marketers’ perceptions of email marketing ROI. Be sure to share your own analysis of this chart in the MarketingSherpa LinkedIn Group for a chance to be published in a future blog post. Q: What is the estimated ROI from email marketing programs for your organization? When asked to estimate their email programs' return on investment, our surveyed marketers claimed an average ROI of 119%, with B2B and/or B2G marketers claiming the highest return at 127%. A notable disparity was found when breaking down this data by overall email volume. According to our respondents, organizations that sent more than 100,000 emails per month estimated a 94% average ROI, while those who sent fewer than 100,000 messages per month averaged 139%. In a subsequent question in the Benchmark Report, we asked respondents how they believed budget allocations would shift for 2013. Of those who responded, 64% indicated their organizations' investment in email marketing was expected to increase. Have you experienced ROI for your email spends similar to these? To what would you attribute any substantial differences? Have you noticed any discernible patterns of ROI that you’d attribute mostly to the number of messages sent? How have your ROI results affected future budgeting? 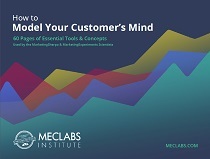 For more information about email marketing, download the free excerpt from the 2013 Email Marketing Benchmark Report. 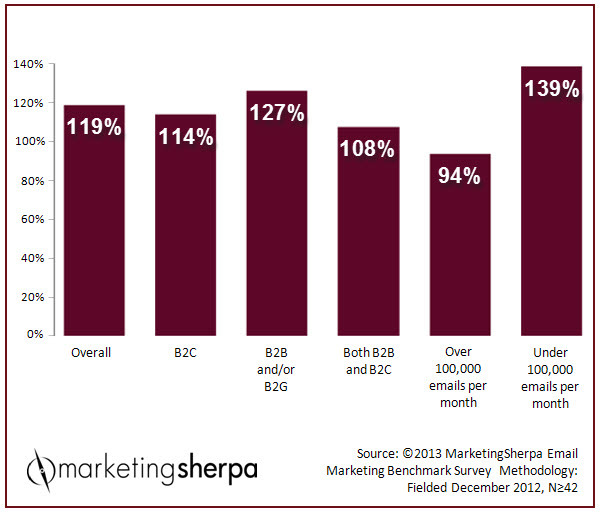 Be sure to share your own analysis of this chart in the MarketingSherpa LinkedIn Group for a chance to be published in a future blog post. Marketing Metrics: Is the emphasis on ROI actually hurting Marketing?